Are netbooks back with a vengeance? This is a generally well-built machine with solid battery life and a very tempting price tag, though there are some niggles in terms of components and the flex in the keyboard. The arrival on the market of Google's Chromebook a few years ago took the industry by surprise. Not so long before, many had predicted that tablets would kill netbooks, which were essentially Chromebook competitors with a Windows operating system. Figures showed that this prediction was apparently correct as sales for the form factor slumped massively. The success of the Chromebook caused many in the PC industry to reconsider the netbook form factor so it is not surprising to see the likes of HP, Lenovo, Acer and Asus come forward with affordable laptops that offer the full Windows experience in a shrunken form factor. 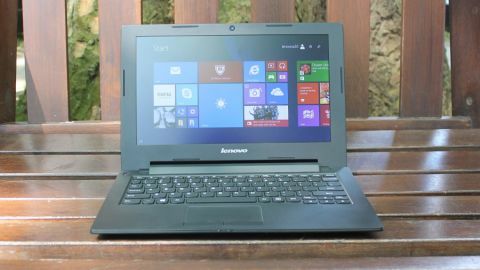 Out of all these machines, the Lenovo S20-30 is the cheapest, currently retailing for £129 at Tesco (around $200, or AU$260) – note that this is when using a voucher code. The price does fluctuate though and can go up by as much as £40. Now given that a full copy of Windows 8.1 costs about £80 and Windows is only available for free to devices with a screen size smaller than 9-inch, the S20-30 represents great value for money. A more expensive version features 10-point multi-touch functionality plus a more powerful processor, twice the memory and a 500GB HDD for an additional £30 (this is £200 at Amazon, which is around $305, or AU$400). Note that the test model we received is not currently available in the UK. In fact, our review sample was a US machine, so versions elsewhere might have different keyboard and software options. Despite its price, the S20 doesn't look half bad. Yes, it is made of plastic but it is neither flimsy nor does it look tacky – opting for a matte black finish helps tremendously, as does the fact that Lenovo chose a textured finish for the top and bottom of the laptop. At 1.3kg and with a 20.9mm thickness, this machine is portable enough to be carried around without much issue. As expected, it doesn't have an optical drive, although you can buy an external one for a tenner. There are plenty of vents on the laptop to allow air to flow to cool the internal components, and the S20 comes with four rubber feet that raise the device by a considerable amount relative to its size. On the left is an Ethernet connector, HDMI port, a restore system and a USB 3.0 port. To the right, there's an audio port, the power plug, a USB 2.0 port and an SD card slot. It is worth noting that the S20 uses the same power adaptor as the Lenovo Thinkstation E50 and the Lenovo Yoga 2 Pro. Doing so brings down the bill of materials and makes finding replacements easier. Lift the lid and you'll find a good sized keyboard and fairly large touchpad. As expected, the S20's chassis has some flex and the keyboard, an AccuType model with slightly curved keys which is spill-resistant, is no exception especially near the middle. If you're a power typist (i.e. you like to hear yourself typing), that might be a major gripe for you. As is increasingly the case now, the function keys are reversed – you have to press Fn+F2 to get F2, which is annoying for spreadsheet users. The touchpad is comfortable enough (fingers glide well and it offers a good level of responsiveness) and has two physical keys – it is textured and, in my experience, adding texture tends to numb your fingertip. Like the rest of the laptop, the display is a matte one. It's an 11.6-inch TN model that has a 1366 x 768 pixel resolution, and it's visually on par with other similarly priced competitors that we've tested in the past. Brightness and contrast could be better but users can always tweak their display settings. Viewing angles could be improved as well, but that's not a show stopping issue. The S20 we received comes with an Intel Pentium N3530 processor, a CPU that is not on sale in the UK. It is a Bay Trail processor that packs four cores, has a base clock speed of 2.16GHz and overclocks to 2.58GHz, and it boasts Intel HD graphics and 2MB cache. There's 8GB of on-board memory (which you can't upgrade), a 500GB hard disk (a Western Digital Scorpio Blue drive), 10/100Mbps Ethernet, Wi-Fi, an HD webcam, a pair of speakers with Dolby Advanced certification, a 36Whr battery which Lenovo says should last five hours, alongside Windows 8.1 with Bing and Bluetooth 4.0. Lenovo also bundled a few applications like VeriFace Pro, Skype, Zinio, Cyberlink YouCam, Evernote and Amazon Kindle. If you don't need any of those, simply uninstall them. Bear in mind as well that this particular model does come with the infamous Superfish adware which you should uninstall. Unfortunately, the benchmarks won't paint a realistic picture of what you will get from the S20 available in the UK. The two popular models currently on the market both run Intel Celeron chips and less on-board memory. Expect them to be slower than the one we've tested because of a lower amount of cache (for the N2830) and slower base/turbo clock speeds for the CPU and the graphics. Battery life should be almost identical as the processors and memory modules consume more or less the same amount of power. The fan never really bothered us during the entire duration of our benchmark tests.